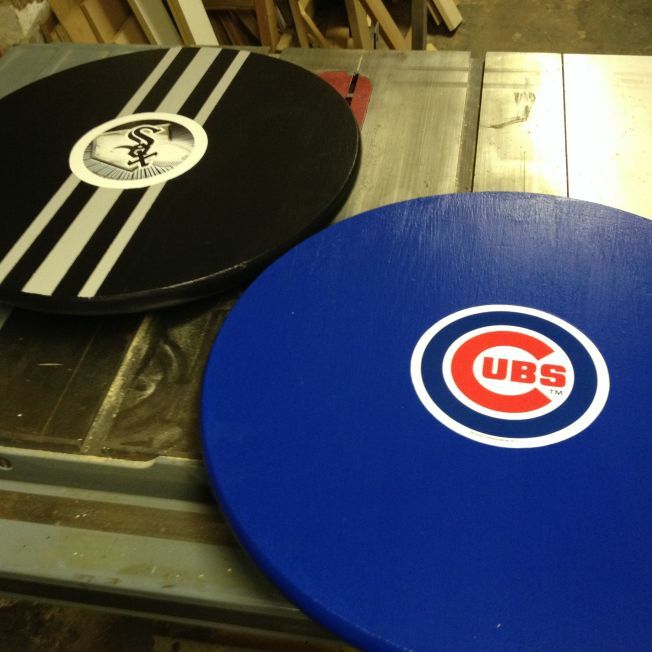 Crete your own White Sox or Cubs themed Lazy Susan for a bratwurst and hot dog buffet. Wayne's Weekend: Make your own MLB Lazy Susan for your next pregame party. A Lazy Susan is perfect for any buffet, both inside and outside. But, with baseball season upon us and grilling season not too far away, I thought it would be great to put together a sports related Lazy Susan and set it up for a beer brat and hot dog buffet. I’ve created a set of plans in PDF format, along with the video from the segment, should provide complete step-by-step instructions on how to build a Lazy Susan of your own. I’m also detailing the basic steps below along with my beer brat recipe. Fill a large pot with beer and add brown sugar. Split onions lengthwise and then cut them crosswise. Add to pot along with peppercorns and salt. Bring mixture to a boil, stirring occasionally to dissolve sugar. Add brats and reduce to a medium simmer. Simmer brats for 20 minutes. Remove brats and brown them either on a grill or in a lightly oiled medium-hot saucepan, about 5 minutes per side. Once browned, return brats to beer mixture until ready to serve. To serve, remove onions from beer mixture with a slotted spoon or mesh ladle and transfer to a serving bowl. Place a brat in a bun, top with mustard and onions. Where I purchased each of these materials is listed below. If the rounds are rough and you’d like a smoother finished product, sand the the rounds to smoother out all surfaces. Once sanded and smooth, mark the center of the large and small round and then create a line through it. Using the square, create a second line perpendicular to the first. The Lazy Susan hardware has two sides that rotate independent of each other using ball bearings. Each side has either 4 or 8 holes in it. Take the side with four holes and line it up on the small round so that the holes are perfectly centered over the lines. Mark the center of the holes with a pencil. Remove the Lazy Susan hardware and drill 1/4” inch deep pilot holes with the 1/8” drill bit. Repeat the process with the large round using the other side of the Lazy Susan hardware and the 4 larger holes. Now that the pilot holes are all drilled, lightly sand away the pencil lines and put 2 primer coats on the rounds. After the primer coats have dried, the next step is to apply two coats of your team color. If you’d like a center circle to be in a reverse color to support a round logo decal, mark a circle with glass, bowl or plate. Cover the area, plus a little more, with layers of overlapping masking tape. Then trim away the excess using the original glass, bowl or plate and an x-acto blade. Press the tape to seal in the masked area and paint the round. Let it dry fully before removing tape. Also, if you want to add pinstriping or contrasting colored lines on top of the main color, use masking tape to define the area to be painted and carefully apply the contrasting color. Once all paint has dried, place the Lazy Susan hardware over the smaller round and line up the holes with the drilled pilot holes. Secure it by putting the screws through the hardware and into the pilot holes. Once secured, rotate the top portion of the hardware by 90 degrees. Using a pencil, mark a circle into the smaller round directly below one of the larger holes of the top portion of the hardware. Rotate the top section back in line with the lower section. Using the 5/8” spade bit lined up with your mark, drill a hole into the smaller round (be sure to place a piece of scrap wood below the round so that the drill bit has space to drill into beyond your smaller round. Turn the small round over and place it on the pilot hole drilled side of the larger round. Looking through the 5/8” hole you’ve created, rotate the Lazy Susan hardware so that you can see one of the holes of the top section. Line up the hole with one of the pilot holes in the top round. Drill a screw into the hardware but don’t screw it tightly. Rotate the small round until you can see the opposite screw hole in the hardware. Line that hole up with the pilot hole and that side. Tightly screw this screw into the hole to secure the hardware. Rotate the small round to find the other two corners of the top hardware and secure it into place. Return to the first screw and fully tighten it. Turn the Lazy Susan over. Add any final decals and it’s ready to use.